In 2015, former State Sen. Sam Blakeslee, tackled head-on the problem of transparency in politics when he launched the Digital Democracy Project at the “Institute for Advanced Technology and Public Policy,” at Cal Poly San Luis Obispo. 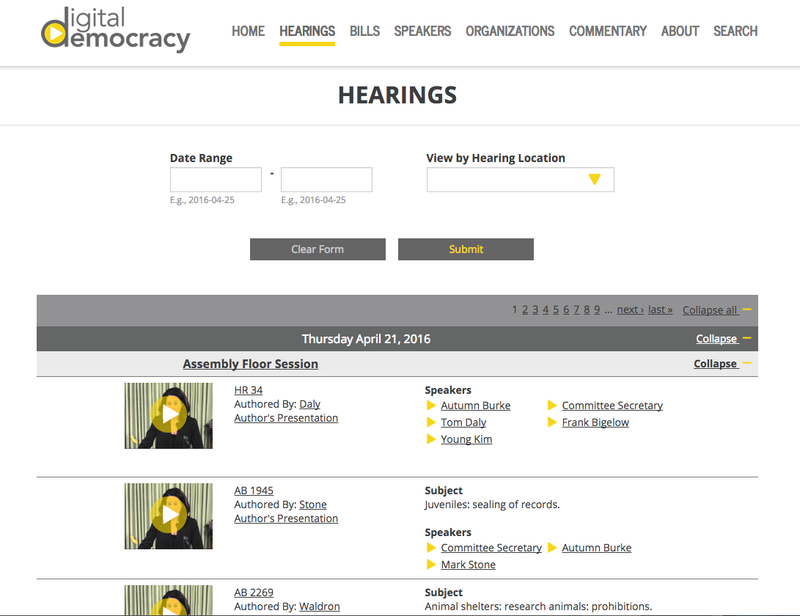 Digital Democracy provides a searchable database of all legislative hearings in California. The end goal is to significantly empower citizens to better understand and engage in the legislative process. Now Digital Democracy Platform has launched new interactive features for 2016 to their open government platform including legislative floor sessions to the searchable archive, an email alert system, organization profiles, and custom video storing and editing capabilities, enhancing and expanding Digital Democracy’s efficacy. The goal is to make California state government more transparent and accessible to grassroots groups, citizens, and to provide broader opportunities to improve civic engagement. I am a contributor to Digital Democracy, and am very excited about the new interactive features. Digital Democracy was built by Cal Poly students and faculty at the IATPP. The online platform uses voice and facial recognition technology, data mining and natural language processing to provide Californians access to state legislative policy hearings and floor sessions. The GoogleTM-like search functionality allows users to identify key capitol players and their connections to campaigns, interest groups and other legislative actions. This first-of-its-kind online tool uses 21st century technology to open California’s government and empower all citizens with a voice in Sacramento. Once legislation has passed specific policy committees, bills are next debated and voted on in wider floor sessions that include the entire elected body of both the Senate and the Assembly. Digital Democracy currently provides users the ability to search specific legislative testimony within Senate or Assembly policy committees. The new feature provides the public the ability to apply the same search and content export capabilities to floor sessions. The IATPP team developed an email alert system that allows users to create a free Digital Democracy account, enter the keywords, phrases, bills, and/or speakers they want to follow, and receive an email notification when new video content is added to the site matching their specific criteria. By creating a free Digital Democracy account, users can create custom video clips of the key moments of interest. These clips are saved and stored the user’s private account, and can be quickly and easily shared through social media or embedded in a website or newsletter. In addition to being able to search hearing videos, users are able to navigate content organized by speaker or bill by viewing individual profile pages. The new organization profile pages now allow users to view also testimony offered by representatives of an interest group. The collection of videos displays the bill on which the organization testified and their position on the legislation. Under the guidance of Sam Blakeslee, the nonpartisan, interdisciplinary organization’s mission is to develop practical solutions to societal issues by informing and driving public policy through advanced technology. Teams of Cal Poly faculty and students, together with public policy leaders and industry experts build technology solutions to pressing real world problems. This entry was posted on Monday, April 25th, 2016 at 4:00 pm and is filed under Blog Posts.